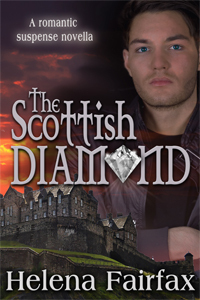 Stressing the Hero from The Scottish Diamond by Helena Fairfax. Helena Fairfax writes engaging contemporary romances featuring heroines she’d love to have as a friend and heroes she's secretly in love with. Her first novel, The Silk Romance, was a contender for the RNA’s New Writers' Scheme Award and a runner-up in the Global Ebook Awards. She was shortlisted for the Exeter Novel Prize in 2014. Helena is a British author who was born in Uganda and came to England as a child. She's grown used to the cold now, and these days she lives in an old Victorian mill town in the north of England, right next door to the windswept Yorkshire moors. She walks this romantic landscape every day with her rescue dog, finding it the perfect place to dream up her heroes and her happy endings. What do you do when it seems you can't trust anyone...even the man you love? When Lizzie Smith starts rehearsing Macbeth with her theatre group in Edinburgh, she's convinced the witches' spells are the cause of a run of terrible luck. Lizzie's bodyguard boyfriend, Léon, is mysteriously turned down for every job he applies for, until he's finally offered the job of guarding "The Scottish Diamond," a fabulous jewel from the country of Montverrier. Léon Bressac is a bodyguard. He’s been invited to a glittering party at the Palace of Montverrier and is supposed to be off-duty, but he’s concerned about the safety of the heroine, Lizzie, who is acting the part of the princess. How does the hero feel about being at this particular party, and what body language is he displaying that gives it away? He wishes he could relax and mingle with the others but he’s on the alert for danger. He stays at the edge of the grand ballroom where he has the best view of what’s going on. He remains aloof. His poor background in Italy also means he doesn’t feel totally comfortable socializing with the wealthy. He finds their conversation shallow. Léon is half-Italian and he loves red wine but has stuck to soft drinks at the party in order to keep a clear head. He doesn’t usually drink a lot but when he’s off work and spending time in his house on the Italian coast, he feels more relaxed and likes a few glasses of Italian red wine. It’s because he needs to know who is a friend and who is a foe, and where people are at all times. He’s the sort of man others latch onto. He’s a trained bodyguard and so he’d be aware trouble was brewing before it started and would intervene before it got out of hand. The one that does the tossing! He leaves when Lizzie leaves and he knows she’s safe. The hero has a troubled background and has been in trouble with the law. If he’s pulled over by the police he keeps quiet and says as little as possible. He runs toward the danger and hopes it isn’t the heroine screaming. That he should step in and break it up. Grabs hold of the guy doing the beating. The only time Léon ever panics is when he thinks Lizzie may leave him. If he thinks he’s over his head in a rescue situation he stays calm, takes a step back, and thinks things through with cold logic. He’s a patient man and he’ll wait for the right opportunity. If it doesn’t come he just defends himself as best he can. The hero runs into the one person from his past he wanted to avoid. He can't get out of the situation and must interact with him/her in some way. What does he do? Léon runs into a few guys from his troubled past in The Scottish Diamond. He finds it hard to escape his background but he tries to speak to them in a way that shows he’s strong enough not to be dragged back down. Great question. Léon has sympathy for young hot-heads – he was one himself. He talks to the guy in a calm way that avoids confrontation and lets the younger guy take the credit for his advice. In order to get through, he imagines himself with the heroine in the future, on the other side of his troubles, and the image keeps him strong. What mentor's words come to mind in a bad situation? I can’t say too much without revealing a twist in the end of The Scottish Diamond but Léon has learned the hard way that you should always choose the right path over the easy path. Oh this is really neat. I like this guy. :) Welcome, Helena! Thank you for hosting me, Kayelle. Loved the stressful questions!